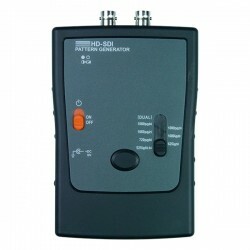 The HD-SDI Video Pattern Generator is an advanced SDI pattern generator that is battery powered, portable, and compact. It generates video test patterns at full broadcast quality for testing and calibrating a digital display. The unit features 8 video test patterns and 7 timings up to HDTV's 1080p. Use to test and maintain studio equipment, such as monitors, cabling, and recording equipment. 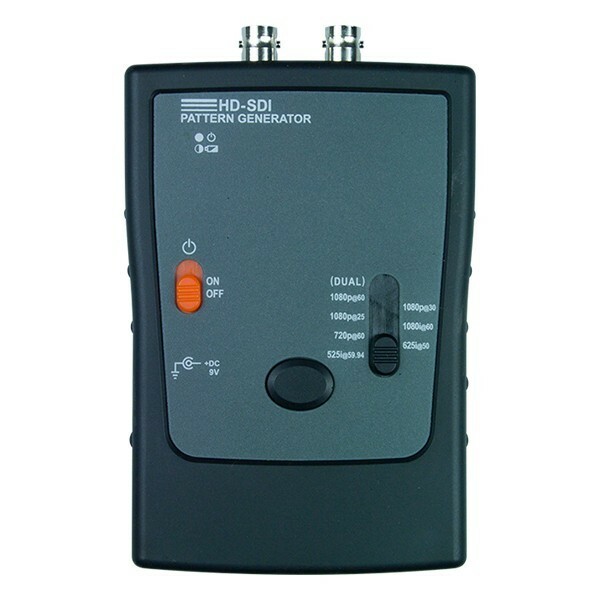 The SDI standard transfer signals are uncompressed and are self-synchronizing between the source (transmitter) and destination (receiver). 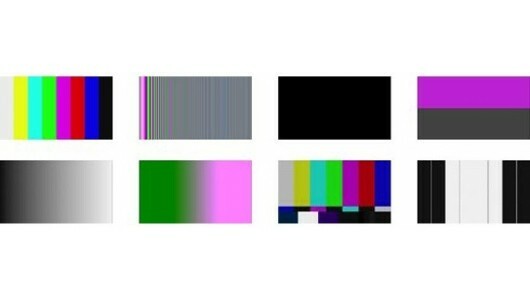 Provides total 7 timings and 8 video test patterns, which include color bar, gray gradient, green/pink gradient, black, and more. Supports audio testing -- 1KHz tone. 1KHz tone is embedded on the video signal and on all test pattern outputs. Front panel control button cycles through test patterns. Resolution switch allows easy switching of SDI video formats. Supports dual SDI ouput for side-by-side comparison of displays. Supported Protocols: SMPTE 274M + 372M, SMPTE 296M, ITU-R BT.601. Bit rate: 1.485Gbps (2.97Gbps Dual Link). Video output: Dual SDI output. BNC connector: 75 Ohm interlocking socket. 120VAC at 60Hz via AC Adapter. Optional 9V alkaline battery (non-rechargeable). WxDxH (in): 3.74x7.48x1.38 (95x190x35 mm).